The panel that I pleated in the last post is now in the process of being smocked. The pattern I chose for the smocking is a simple alternation between a half-step wave and a full step wave. This pattern can be smocked without any diagrams or guides and is very basic. I wanted to keep the color scheme down to beige and black, so the thread I am using is DMC 310 (black). Once I have completed the smocking, I have to block it. To find the center of the panel, I have to lay out the pattern piece for the yoke on the ironing board and do some measuring of sorts. First, I use the line at the 9″ mark as my center, since my board is 18″ in length. The instructions have the front yoke piece being sewn together down the center. Since my panel does not have this center seam, I have to compensate by removing 5/8″ from the center. 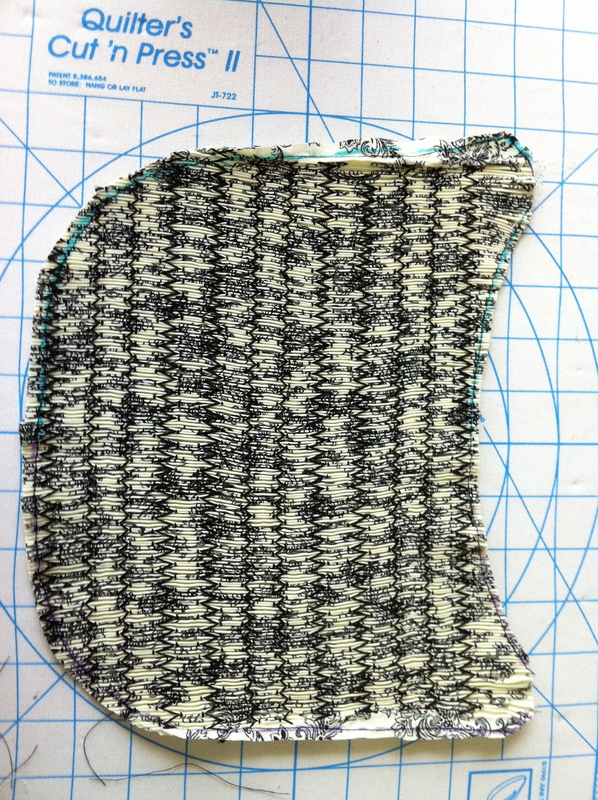 I trimmed a piece of paper to 5/8″ and laid it on the pattern piece. See how the 5/8″ line now runs down the point on the pattern called “center front?” This is the line I place on the 9″ guideline as my center point of the yoke. After finding the center, I can now see how large to block out my smocked panel. It needs to be blocked 6.5″ on each side of the center line, or 13″ total across. I block the smocking panel by stretching it to the proper length and steam “pressing” the pleats in place. Once the piece is dry it will retain the shape and size blocked while you work with it in the pattern. 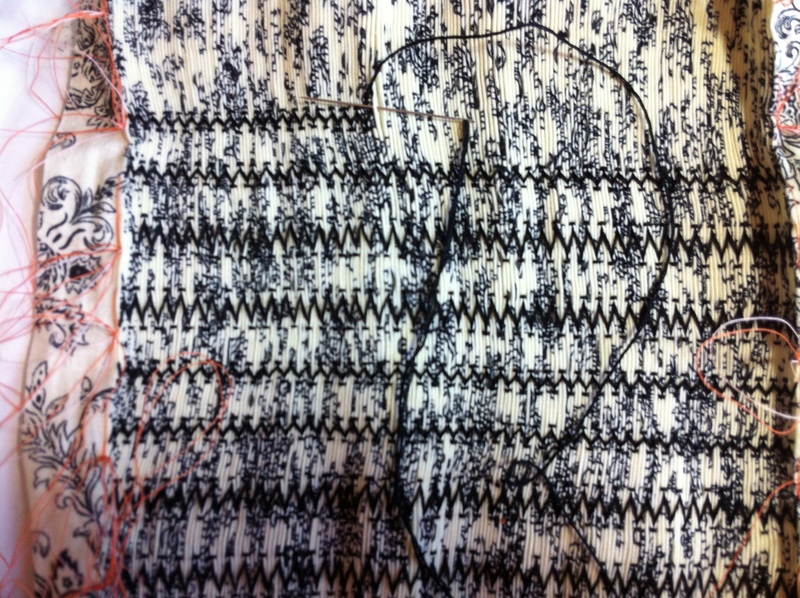 You can see from the photo below that the smocked panel is now blocked and ready for cutting. To cut the smocked panel, I lay the pattern piece on top of the panel and line up the center of the piece. 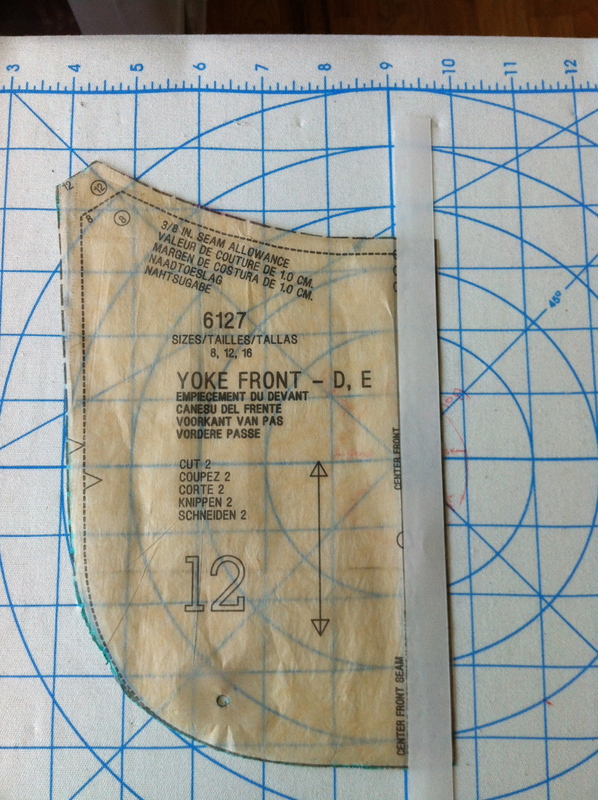 Notice that I folded back the 5/8″ seam line on the pattern piece. With a disappearing ink marker, I trace the pattern piece. Then I sew on, or just inside, the drawn line with my machine. 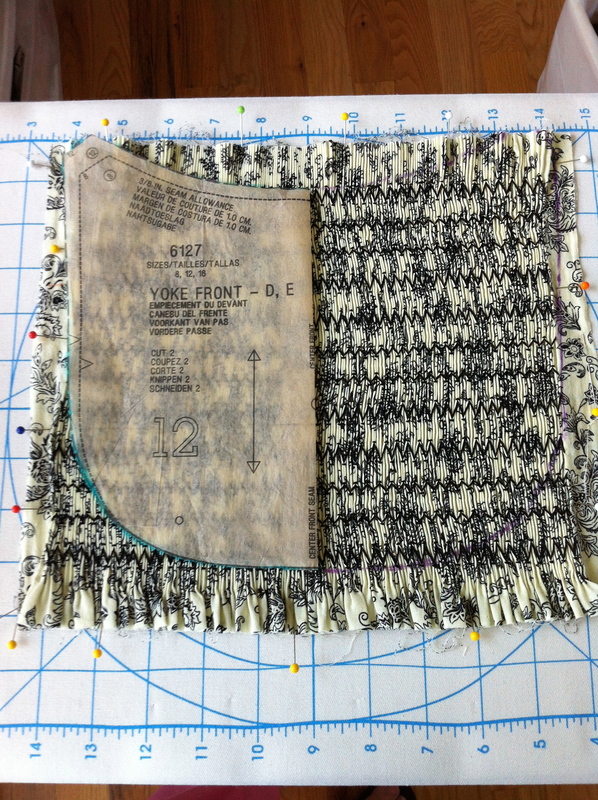 Once the piece has been sewn, cut around the piece on the outside of the stitching line. One problem I ran into with this top was that I did not purchase enough fabric for long sleeves. Top A has sleeves that go halfway down between the elbow and the wrist. This is a style that doesn’t suit me. So, I had to extend the sleeve pattern piece to obtain the long look I desired. However, when I went to cut out my “long” sleeves, I was short on fabric. See how I compensated for this problem in my next post. Until then…happy sewing!! I’m enjoying this series of posts. Thanks! I love reading your posts. Wish I could sew as well as you do. My friend…your talent never fails to amaze me!